As before I have designed a block for both 5″ and 8″ square hoops, using similar elements, some old and some new, but each of these designs is different as it is not possible to put everything into the smaller design. In my first edition of the 5″ block there is a butterfly, a pair of rose buds and a heart pierced by a rose branch with small thorns. The larger block has all these elements and more. 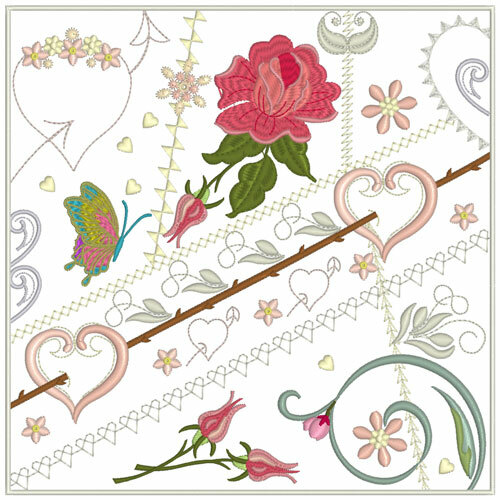 I have introduced a large rose alongside the rose buds and several other hearts. 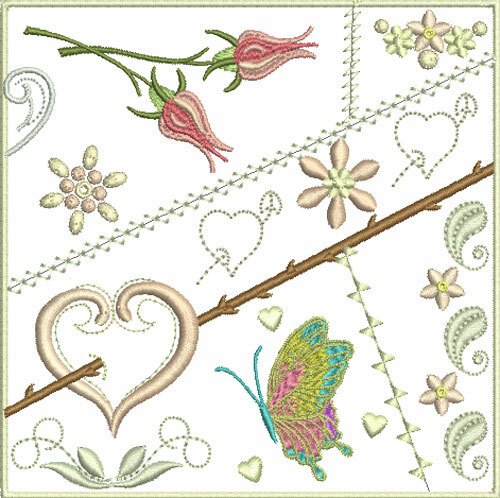 If you have something suitable to replace some of the embroidery, like a purchased lace butterfly then edit that portion of the block out in your embroidery software. I encourage you to personalise and make your block unique! In my first stitch out of the 8″ block, I added 5 pieces of fabric to the deep cream slubby silk dupion base fabric. 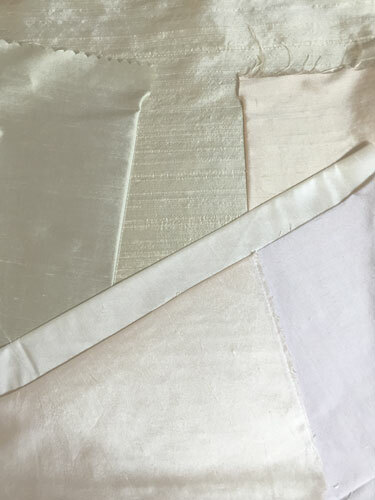 I used subtle shades of pale pink, ivory, pale peach and a yellowy green grey silk that blended well together and with the threads I intend to use. This is very important so I advise that you plan your fabric and threads carefully. The overall colours are pink and green, with a hint of peach. I was uncertain about the butterfly as I thought the turquoise would be too much. More of that in my next blog. Notice the rough edge between the 2 lower fabrics where the fabric has been trimmed. 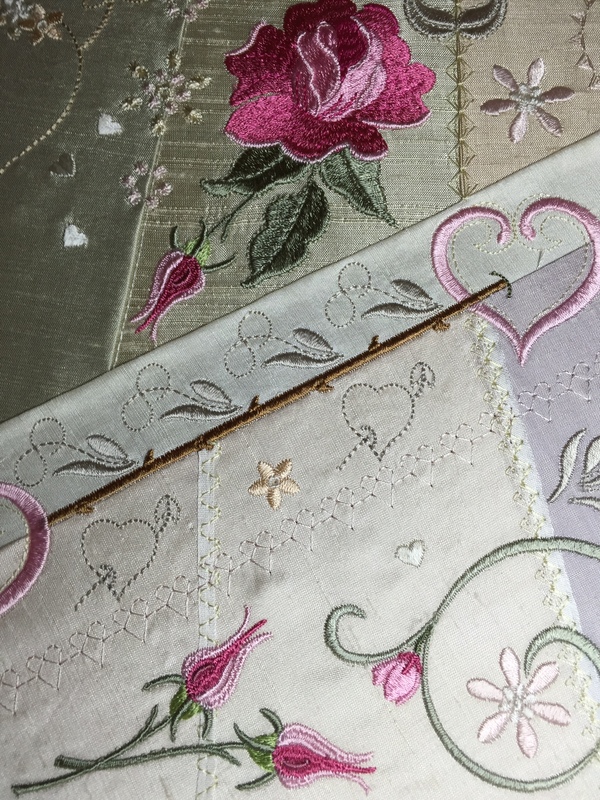 This is covered with silk ribbon and then embroidered on top with open stitches. Another line is also introduced in the same way. 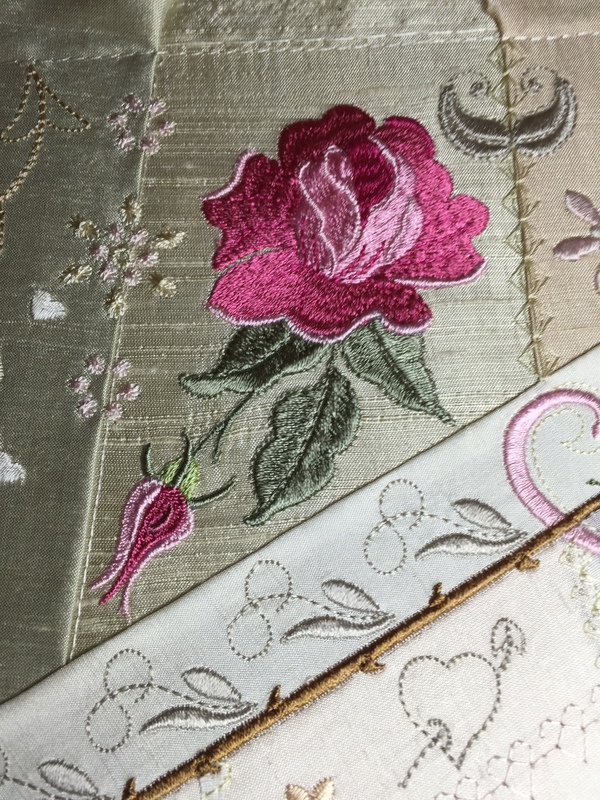 I had not put in guide lines for my initial embroidery so I was not able to get it exactly straight. (Mistakes can always be hidden at the embellishing stage) These have now been added to help you. I have deliberately placed the ribbon on the right slightly off centre for a different look. 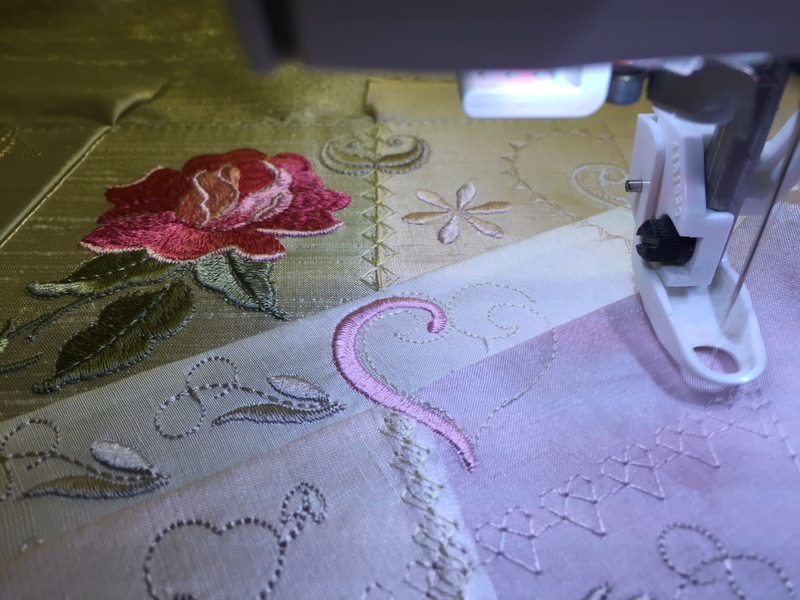 The exciting part of stitching out this block was adding the rose stems with the little thorns which pierce the hearts, which are stitched in two stages so they look more authentic. Here they are and the effect is just as I planned! I was pleased with the way the colours have blended well with the silk fabric. I love the tiny white hearts dotted around the block. There is plenty of space to add your own embellishments to this block. 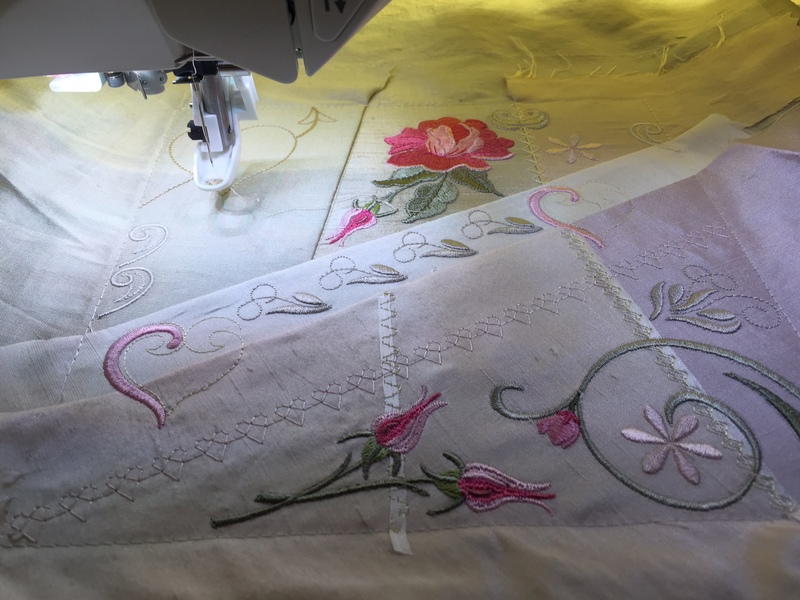 This entry was posted in Discussing machine embroidery, New Designs and tagged Crazy quilting, development of embroidery, embroidery on silk, machine embroidery, The importance of colour, Valentines. Bookmark the permalink. Beautiful, as usual. We are blessed with having your designs and you’re talent.